Places to see in Sajong: The quaint village of Sajong houses a nationally awarded statue factory, caves and traditional farms. The location offers a spectacular view of Gangtok during nighttime and far fetched views of the boundaries of Tibet and Bhutan. Two notable monasteries namely Rumtek monastery and Ranka monastery are also located nearby. Rumtek, popularly known as the Dharmachakra Centre is a Tibetan Buddhist monastery in Sikkim. The monastery was originally built in the 16th century by the 9th Karmapa Wangchuk Dorje. This splendid gumpha is located at a distance of 24 km from Gangtok. If you walk for few minutes downhill from the new monastery, you will reach the old monastery, built in 1730 by the ninth Karmapa. The view of the Rumtek Monastery decked with prayer wheels at the entrance is truly a visual treat. The monastery houses gold plated statues of Buddha. The inner side of the Monastery is admired with several drawings and depictions. The best part of the monastery is that tourists are allowed to explore the most of the interior of this monastery. There are also more than 20 varieties of Bamboo growing in Sajong. Bamboo is a symbol of vitality and flexibility. Nearby attractions of Sajong: The capital city of Gangtok, just 24 kms from Sajong is admired with a number of tourist attractions, which you can visit by arranging day trips from Sajong. Some of the major nearby attractions are Tibetology Museum, Do-Drul Chorten, Orchid Exhibition, Enchey Monastery, Tsomgo Lake, Phodong Monastery and handicraft and Handloom Industries. 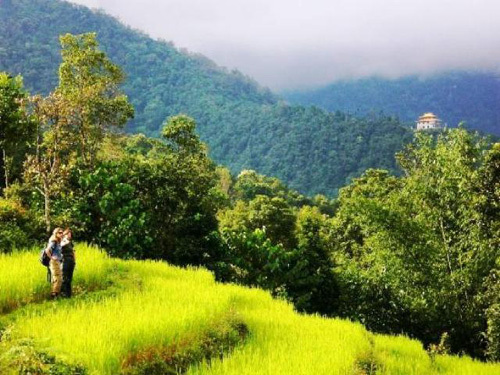 Things to do in Sajong: Enjoy a nature walk while exploring the village of Sajong and Rumtek. You can also rent a Mountain bike to move around the area. Two days guided treks are also arranged to Tinjure Ridge, from where you can savor the majestic view of the third highest Mountain of the world, Mt. Kanchenjunga. Visit the local Buddhist monasteries along with local guides. You can also arrange for picnic at the nearby locations. Many tourists also indulge in swimming at Ray Khola mountain-river. How to reach Sajong: The nearest airport of Sajong is the Bagdogra Airport in West Bengal. You can reach Sajong from Bagdogra in 4 hours by cars. Best time to visit Sajong: You can visit the destination any time of the year. However, to get a clear view of Mt. Kanchenjunga, it is best to visit the place between October and March. Lodging and dining facilities in Sajong: The only place to stay in Sajong is the luxurious Himalayan boutique resort The Bamboo Retreat. The Bamboo Retreat is our Preferred Property (Click here to know more about our other Preferred Properties and how to get the discounts on them). 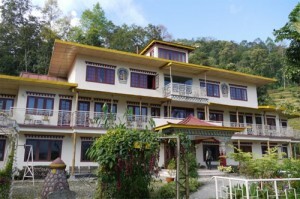 The retreat is best suited for those seeking a place away from the hustle of the city, who enjoy a mix of ethnic and global good-quality homemade cuisine, who are interested in meditation, Sikkim’s history, undertaking day-walks and generally as a starting point to explore other parts of Sikkim. The hotel’s architecture is inspired by Sikkim’s monastic architecture that originated from Tibet. Bamboo, an eco-friendly under-valued material has been much used in interior decoration.